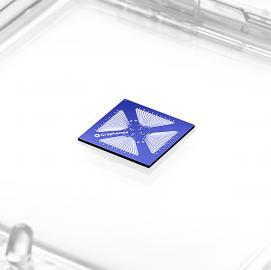 Graphenea has launched sales of GFETs (graphene field effect transistors) aimed at lowering barriers to adoption of graphene, especially the sensors market. Researchers needing GFETs for their applications, whether in gas, biosensing, or other applications, can now purhcase high-quality GFET devices. 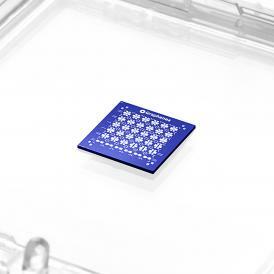 Graphenea has started by launching two standard GFET-for-sensing configurations called GFET-S10 and GFET-S20, each including 36 individual GFETs on a one square centimeter die, but differing in device layout. The GFET-S10 has devices distributed evenly over the die and the GFET-S20 has the devices concentrated in the center of the die with electrical pads located at the die edge. The GFET-S20 devices all have a 2-probe geometry for probing electrical properties during sensing, whereas the GFET-S10 houses 30 devices with the Hall bar geometry and 6 with 2-probe geometry. The Hall bars enable magnetic field sensing, apart from applications in graphene device research, bioelectronics, biosensing, chemical sensing, and photodetectors that the 2-probe geometry also allows. In the coming months, Graphenea plans to launch a custom design service for the same high-quality GFETs in tailored arrangements. The new devices from Graphenea have a specified carrier mobility above 1000 cm2/V*s, residual charge carrier density below 2 x 1012cm-2, Dirac point between 10 and 40V, and a yield higher than 75%. The GFETs are made on the standard Si/SiO2 substrate, with Ni/Al metal contacts.